CAPITALlessISM, A blueprint for national E-conomy. 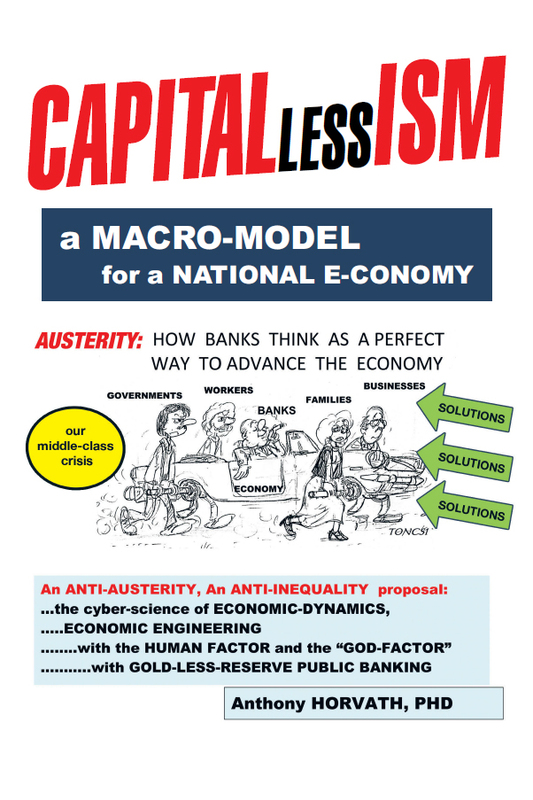 CAPITALlessISM proposes a strong free-enterprise-based, democratic national E-conomy model when no capital is available, either because of a crisis or by speculations. It proposes SCIENTIFIC SOLUTIONS FOR THE DESIGN OF AN E-CAPITAL-BASED PUBLIC-PRIVATE COOPERATIVE BANKING SYSTEM. It proposes economic engineering to create a commodity-based virtual-capital, a national public bank, a nationalized artificial capital creation process called “fractional-reserve-banking” rights, licensed back to banks, and various processes to activate its E-capital circulation in order to achieve a dynamic E-conomy. This is not Socialism, nor Communism. It is COMMUNITY-ISM based on human and spiritual values where inequalities will still exist resulting from individual efforts, yet everybody has a fair financial starting chance for free enterprise. Some of our controversial ideas are not politically right. Austerity is outdated. The nature of national debts may be reexamined. It is inspired by Roosevelt’s second bill of rights and Edison’s visions of a commodity-based currency. It is also inspired by the efficiency of our blood circulatory system, which provides oxygen to trillions of cells. Our proposed MACRO-MODEL copies this model for an efficient “E-capital” circulation to assure survival and to sustain everyone’s productivity. NOTE: this publication is really 3 books together in one. Each one treats the topic in an increasingly more-and-more detailed depth level. It helps to keep the overall scope of the macromodel while we study the theory in increasing details. For more information please go to our website, www.capital-less-ism.com or www.capital-less-ism.ca.